Create Isocam creates an orthographic camera with which you can render isometric views. You can choose between three camera setups. I host this script at my server. But my server goes down for a few days now. So i attach the script directly here. 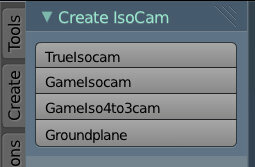 # This script creates two kinds of isometric cameras. #The one, TrueIsocam called camera, is the mathematical correct isometric camera with the 54.736 rotation to get the 30 degrees angles at the sides of the rhombus. # Then there is the special case with a 4:3 ratio, which is button 3. You can also make 2D games with that one. The view is more topdown though as with a 2:1 ratio of the traditional game iso view. # The fourth button creates a simple groundplane where you can place your stuff at. #You can of course set up everything by hand. This script is a convenient solution so that you don't have to setup it again and again. """Creates a camera for mathematical correct isometric view"""
bpy.ops.object.camera_add(location=(30.60861, -30.60861, 30.60861)) # Create Camera. I would love to set the rotation here too. Blender not. Not that there are no tutorials around which shows that it should work ... .
object.rotation_euler = (0.955324, 0, 0.785398) #Attention, these are radians. Euler angles are (54.736,0,45) Here we set the rotation for a mathematical correct isometric view. Not to mix with the Isoview for a 2D game! object.name = "TrueIsoCam" # let's rename the cam so that it cannot be confused with other cameras. """Creates a camera with isometric view for game needs"""
bpy.ops.object.camera_add(location=(30.60861, -30.60861, 25.00000)) # Create Camera. I would love to set the rotation here too. Blender not. Not that there are no tutorials around which shows that it should work ... .
object.rotation_euler = (1.047198, 0, 0.785398)#Attention, these are radians. Euler angles are (60,0,45) Here we set the rotation for a isometric view that is used in 2D games. Not to mix with the mathematical correct Isoview! object.name = "GameIsoCam" # let's rename the cam so that it cannot be confused with other cameras. """Creates a camera with a special 4:3 iso view for game needs"""
bpy.ops.object.camera_add(location=(23.42714, -23.42714, 37.4478)) # Create Camera. I would love to set the rotation here too. Blender not. Not that there are no tutorials around which shows that it should work ... .
object.rotation_euler = (0.724312, 0, 0.785398)#Attention, these are radians. Euler angles are (41.5,0,45) Here we set the rotation for a isometric view that is used in 2D games. Not to mix with the mathematical correct Isoview! object.name = "GameIso4to3Cam" # let's rename the cam so that it cannot be confused with other cameras. 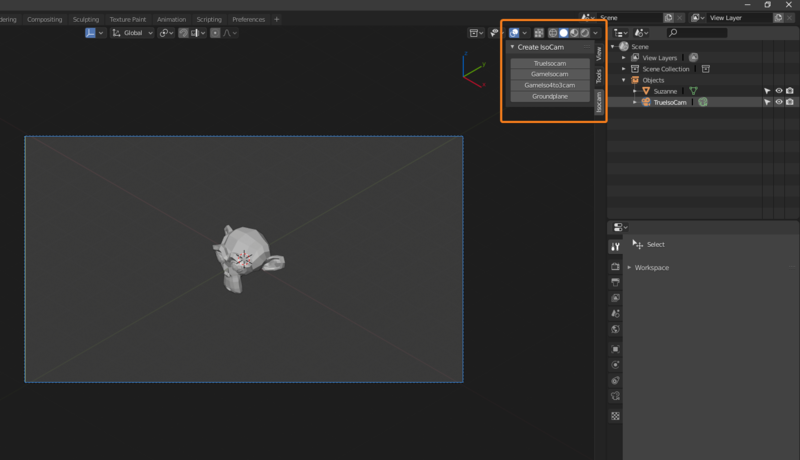 """Creates a groundplane in size of ten where you can put your things on"""
Will this be updated for Blender 2.8? Yes, please update. This script is essential to my project. Thank you very much. The panel can be found here.